Pechoqueolin was a sizeable village located on a peninsula north of where Gallows Run empties into the Delaware River, not far from Kintnersville. The location is in full view from Top Rock along the Narrows of the River. The Shawnees under their chief Kakowwatchy moved here in 1698. The town was mostly in Durham Township but spread into adjoining Nockamixon. It was opposite Pechoqueolin that the Lenape and the Shawnees fought the great battle of the Grasshopper War. Early white settlers are said to have used the skulls and bones of the Indian dead instead of cornerstones to mark their land purchases. It was here that Chief Nutimus, leader of the Delawares and noted Indian doctor, lived until 1742 when the tribe was forced to move west. 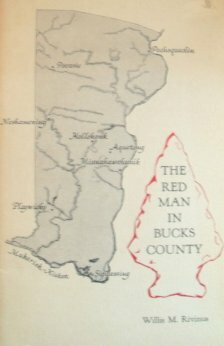 Discovery of the site of Pechoqueolin is credited to John A. Ruth of Durham who read the following paper before the Bucks County Historical Society, July 27, 1886: “It extends along the river several hundred yards and from fifty to one hundred yards back. Its extent can be traced by the numerous broken cobblestones and chips of quartz and jasper which are thickly strewn over the surface and imbedded in the soil. Many of the cobblestones bear marks of fire. The chips of quartz and jasper are marks left by the ancient arrowmaker. They are an unerring guide to the archeologist. When they are abundant, he is almost sure to find arrowheads and other implements. Many fine relics have been found among the refuse of this aboriginal village. They exhibit all degrees of workmanship, from the rude ‘turtleback’ to the finest chipped spearpoints and arrowheads. The most abundant relic is the arrow-head, of which several hundred specimens have been collected. Many of them show by their excellent workmanship that hey were made by a people who had reached a high level of skill in the stone art. Stonehammers, sinkers, plummets, scrapers, and spear points are plentiful. The last named are generally broken. Among the other implements are polishing stones, grooved-axes, celts, knives, pestles, hoes, drills or perforators, ceremonial hatchets, and amulets. Fragments of pottery are plentiful. It is made from a mixture of clay, pounded quartz, and shells, and is of rude manufacture. Some fragments are well preserved, while others are crumbling and have the appearance of great age. Some pieces are rudely ornamental and sometimes perforated in order to suspend the vessel by a string. Buckwampum Mountain is located in eastern Springfield Township, not far from either the Durham and Bethlehem roads, between which it lies. It is identified on some maps as Pocacuintink. This unique hill is known from the fact that it has a swamp on the top. The name means “a round bog.” Tradition says that the Lenape lived and hunted near here right down to the Revolution. This 820-foot hill is still a great attraction to naturalists who find rare orchids and other little-known plants here. These same plants probably served the Lenape as medicine.